Invaderband are a garage/artrock band assembled in 2012 in Derry, Northern Ireland by Mancunian singer, guitarist and songwriter Adam Leonard who enlisted local musicians to voltage-enhance his dystopian post-punk songs. After honing their live act through 2013-2014, they issued their debut single 'The Implausible Man' in April 2015 on International Record Store Day and the follow-up, 'Attack Of The Pod People' in December 2015. The singles were picked up by local, regional and national BBC Radio, with the latter making it onto the BBC 6Music Recommended Playlist. Originally pencilled in for a late 2016 release, the self-titled debut album finally arrived on 6th January 2017. Since then the record has enjoyed radio play throughout the UK & Ireland (BBC Radio 6Music, BBC Radio Ulster, BBC Radio Foyle, RTE 2FM, RTE 2XM, RTE RNAG & Today FM) and has received widespread critical acclaim (see below for press quotes). 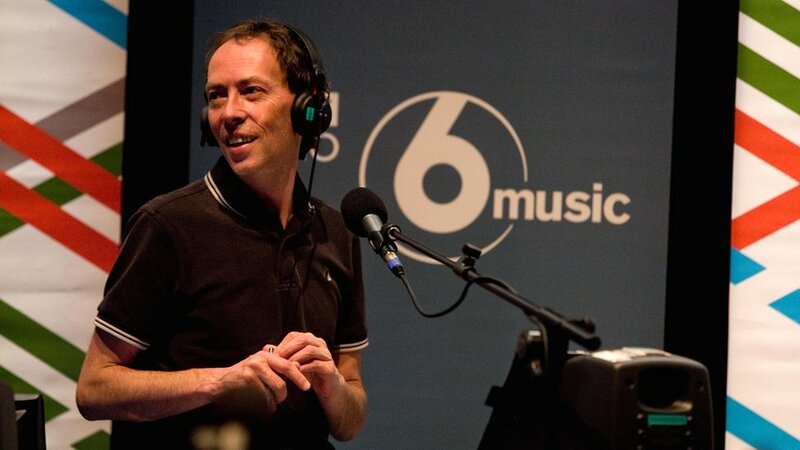 Tracks from the album have now been 6Music Recommended by Steve Lamacq twice. 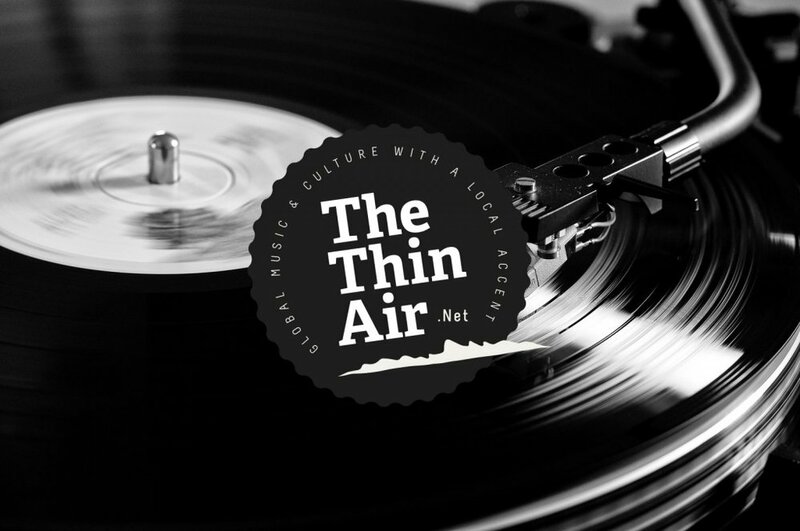 The album was shortlisted (Top 12) for the 2017 Northern Ireland Music Prize Album Of The Year and the current single 'Attack of the Pod People' made THE THIN AIR'S Top 100 Irish Tracks of 2017. The band are currently planning shows for 2018 (email if you'd like to book us) and writing another album, tentatively titled 'Invaderband 2'. 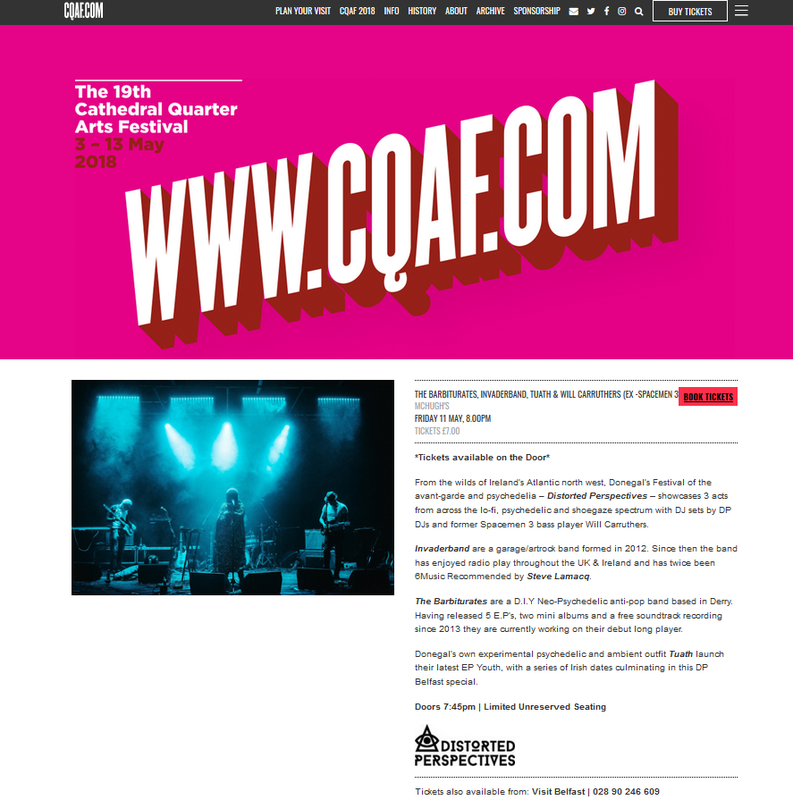 From the wilds of Ireland’s Atlantic north west, Donegal’s Festival of the avant-garde and psychedelia – Distorted Perspectives – showcases 3 acts from across the lo-fi, psychedelic and shoegaze spectrum with DJ sets by DP DJs and former Spacemen 3 bass player Will Carruthers. 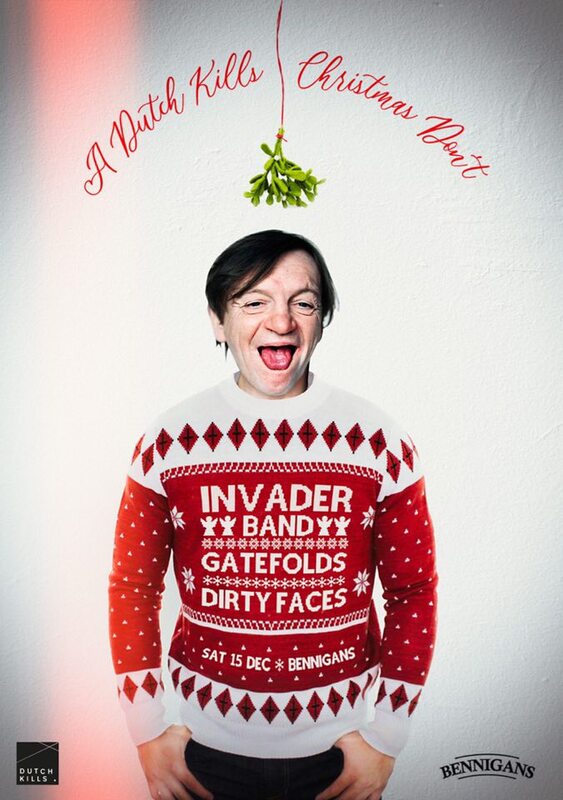 Invaderband are a garage/artrock band formed in 2012. Since then the band has enjoyed radio play throughout the UK & Ireland and has twice been 6Music Recommended by Steve Lamacq. The Barbiturates are a D.I.Y Neo-Psychedelic anti-pop band based in Derry. Having released 5 E.P’s, two mini albums and a free soundtrack recording since 2013 they are currently working on their debut long player. Donegal’s own experimental psychedelic and ambient outfit Tuath launch their latest EP Youth, with a series of Irish dates culminating in this DP Belfast special. "...And make no mistake, it’s been a pretty remarkable year for Irish music. Here’s our take on what stood out best, strongest, and most emphatically of all..."
Our track 'Attack Of The Pod People' made it into The Thin Air’s Top 100 Irish Tracks of 2017. Just! 22/11/17 - NI Music Prize clip about the album by the Oh Yeah Music Centre, Belfast. 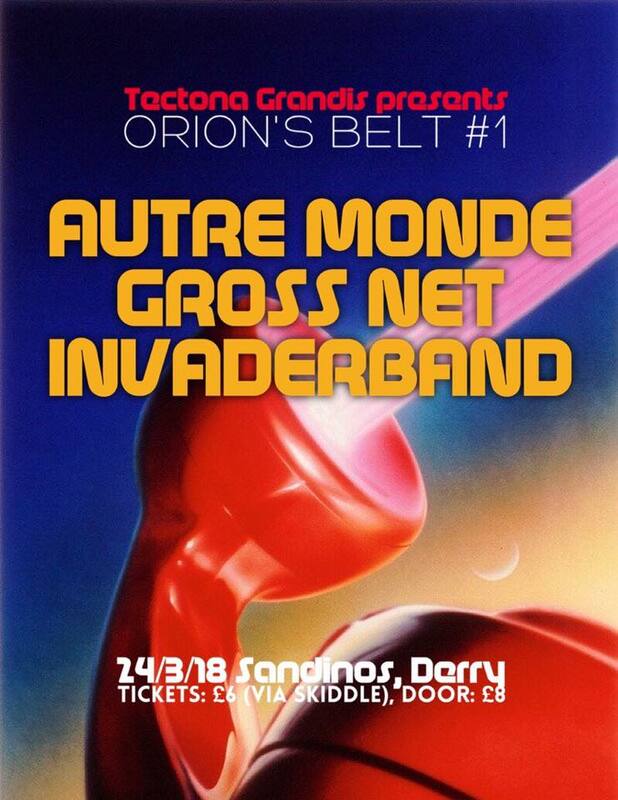 Dublin, opening for the phenomenal Autre Monde. Photo by Wrapped In Plastic. Next gig at Voodoo Vintage, Lower Main Street, LETTERKENNY, Ireland. Entry: 8 euro before midnight, 10 euro after midnight. 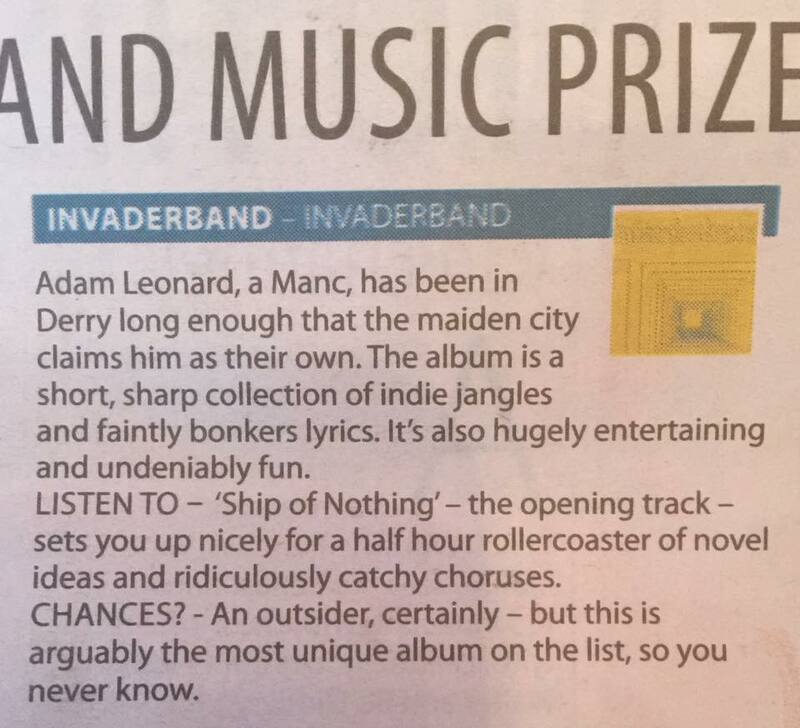 13th October: The Daily Mirror on our chances of winning the NI Music Prize... "An outsider". We're absolutely delighted and shocked to be shortlisted for the Northern Ireland Music Prize 2017. More than 70 judges were contacted from the music industry and music media. They were invited to cast their votes for the best album of the last 12 months, and 'Invaderband' was in the top 12. There will be a second round of voting and the winning album will be announced at a special awards night at the Mandela Hall in Belast on November. Sept 23rd - Click HERE to listen. New gigs announced (see LIVE section below) including The Thin Air's Culture Night Belfast show at the Oh Yeah Centre on September 22nd. Photo from 24/5/17 by Mickey Rooney. More photos via THE THIN AIR HERE. THE ULTIMATE SUPPORT SLOT! WE WERE HONOURED TO OPEN FOR DAMO SUZUKI IN LETTERKENNY. 10th March 2017: Lovely words from The Daily Mirror! 10th March 2017: New interview here. The Making of 'Invaderband' feature on BBC Radio Ulster's ATL. Click on image to listen. Steve Lamacq played the opening track from the album 'Ship Of Nothing' on his BBC 6Music Recommends show.